The weather cooperated for a change on June 15, 2013. Silver Strings was in attendance at the wedding of Alyssa and Gary at Will’s Garden in Cheekwood. I have to say that if you’re going to have little flowergirls in your wedding party, be prepared for them to steal the show. Little Sarah was just adorable in her frothy dress. 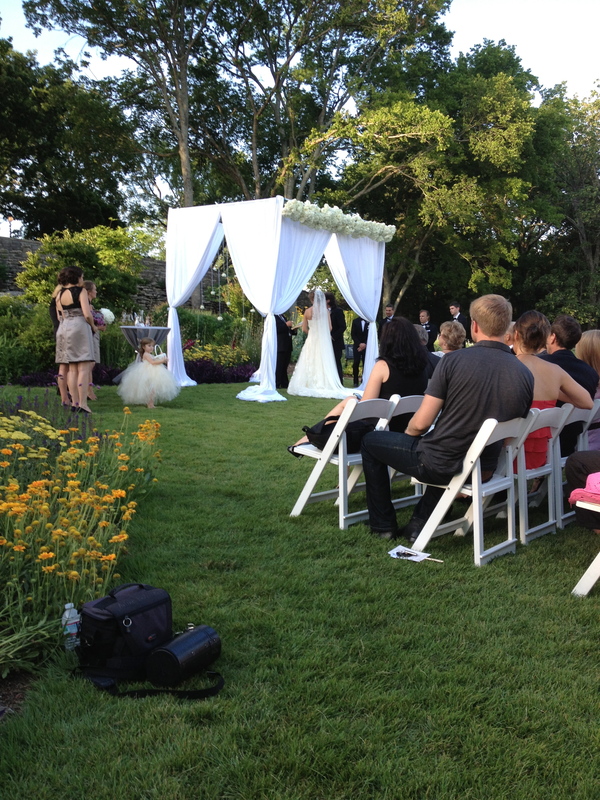 Visually the wedding was gorgeous with the white canopy and the surrounding flowers. And even more sweet was the groom singing to his bride during the ceremony. After the ceremony we convened at the Frist Learning Center to play for the dinner part of the reception. Alyssa’s mom had told me that Alyssa studied piano and had a piece that had been written for her by a friend that was very pretty. We decided to surprise Alyssa and Gary with a transcription of the piece played by the quartet during dinner. It was indeed a lovely piece and we were asked to play it again. Congratulations to Alyssa and Gary and their families! Meanwhile at CJ’s Off the Square last Saturday Silver Strings was present for the nuptials of Ashley and Ryan again, playing very nontraditional music. The rain presented challenges that CJ and Amy handled with foresight and aplomb. The pavilion in the back afforded everyone shelter from the rain until it let up long enough for everyone to take their seats and the processionals began. Some of the prelude music selections included a couple of Radiohead tunes…”All I Need” and “Videotape”, “Soul Meets Body” by Death Cab For Cutie, “Starlight” by Muse. Mothers processed to Elton John’s “Your Song”, bridesmaids to “All I Want Is You” by U2 while Ashley walked down the aisle to Ben Folds “The Luckiest”. The Beatles tune “All You Need Is Love” swept them back down the aisle as husband and wife. Congratulations to Ashley and Ryan and their families! 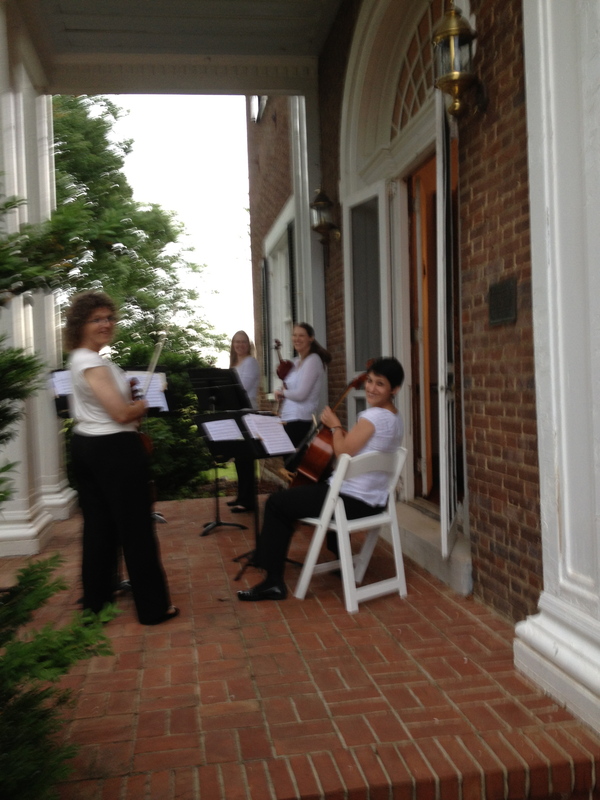 Last Saturday found Silver Strings at the lovely Oaklawn Mansion outside Spring Hill, TN. After much back and forth with the scary weather, first playing the beginning of prelude under a tent as the rain came down in torrents and then dashing out the the original location under a huge tree to complete the planned wedding when the rain let up. I want to say here what a tremendous job Damon Goude, the wedding planner of Regalo Design, did in making a potential disaster into the beautiful wedding Leslie and Nathan had dreamed. Leslie chose popular music for her prelude but then got a little more traditional bringing in the mothers with “How Beautiful”, the bridesmaids to a beautiful song called “A Thousand Years” and herself to “Canon in D”. As we played the Canon the raindrops started falling again and we musicians quickly decamped to stand on the porch of the nearby mansion. Magically the rain held off…we’ll take credit for that by our leaving the immediate area…much like bringing your umbrella so it won’t rain, and the ceremony continued. The couple actually, literally tied a knot in a piece of rope to symbolize….are you ready for this?…tying the knot. As soon as they were pronounced husband and wife we played their recessional, “Home” by Ed Sharpe and the Magnetic Zeroes, a fun, upbeat beginning to their new life. 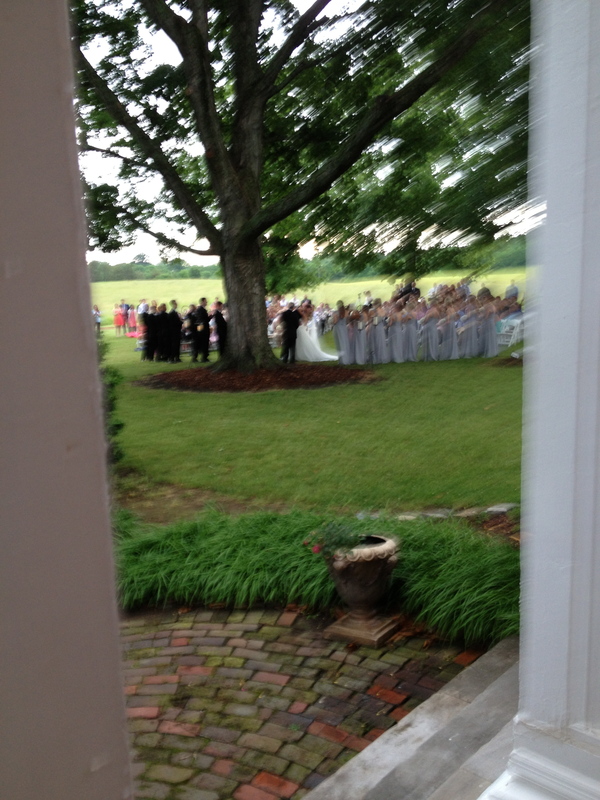 Their recessional path had the wedding party and families passing between us on the porch to go inside the mansion. Sorry about the blurry picture (my camera) but you get the idea. Congratulations to Leslie and Nathan and their families!